TheAwakenedSoul: How Long Does My Soap Need To Cure? How Long Does My Soap Need To Cure? I have received some questions about cure time in soapmaking, so I decided to write a post on it today. When making cold processed soap, we normally wait four to six weeks to use the soap. It's raw, and the lye will damage your skin. Soap needs that time to mellow and age. If you have ever used a soap that gives you a stinging, prickly sensation that is from the soapmaker using too short of a cure time. You can't rush the process. It takes patience. The longer the soap cures, the milder it becomes. Three months or longer is ideal. When making soap, we wear shoes, gloves, goggles, and long pants, and long sleeves so that the lye water does not splatter on our skin. You don't want to risk a chemical burn from the lye water mixture spilling accidentally. I mix mine in the kitchen sink, with the windows and front door open, and have the ceiling fans running. With hot processed soap, the batter is safe to handle once it has gone completely through all of the stages. You can see it turning from a creamy mixture like cold processed soap to something completely different. Here are some photos to show you the transformation. At this point, I had added half of the six ounces of coconut milk that I was using to make the batter more fluid. You can see how the oil is separating from the rest of the ingredients. It needs more cooking and stirring. Now it's starting to shift. At this point, I added 1 T sugar dissolved in 1 T hot water. It's important to have your measuring cups and ingredients warm, not cold. Temperature is critical in soapmaking. Things move very quickly once the soap starts to thicken and come together. This is how it looks at applesauce stage. You are cooking off the lye. It's important not to breathe in the toxic fumes and to keep the room well ventilated. Once the soap finishes cooking, it starts to stick together and pull off the sides of the crockpot. At this point you can turn the machine off, and add your extra ingredients. If you are scenting your soap and coloring it, now is the time. You want to heat the water and cup that you are using for your clay. I used 3 T yogurt at room temperature, and the second half of my warm coconut milk. I also added 1 T of fine seal salt dissolved in 1 T of hot water. Using all of these additives felt counter-intuitive to me the first time. It seemed like so much extra liquid to add, as I am used to making cold processed soap. I was afraid that it would throw off the thickness and ruin the batch. Fluid hot processed is an entirely different technique. It's very effective, though. It helps to watch Youtube videos and to study the method. You can also make it without the additives, but it will be thick and gloppy. You will have to plop it into the mold, and work very quickly. It hardens like candle wax when it hits the cold air. You can sample a bar of this soap right away because it is no longer caustic. That is one of the reasons hot processed appeals to so many soap makers. I let my hot processed bars cure for a couple of weeks, four weeks if I am going to sell them. It's fun to try out your latest soap immediately, and to enjoy the scent and the rich, creamy, bubbly lather. The fragrances don't fade and the bars really feel different, because they are cooked. I also enjoy the clean up, because you just have the crockpot, and you are not worried about touching raw soap with lye. For me, it makes me feel more relaxed. I still clean all of my utensils with boiling water. That's what they do in the labs. It's also a good idea to towel off your faucet handles and clean your counters with vinegar water. When making cold processed milk soaps, (like goat's milk,) the bars need to cure for eight weeks. They require more time than a non milk soap. You can also make hot processed goat's milk soap, and it is safe to use right away. It's a bit trickier, though, because it separates during the cook time. I hope that this answers some of your questions. Let me know if you try it. It's fabulous soap! It is a lot of work, though. Thank you for your comments. They add so much energy and talent to the blog. Please comment in English. I'm sorry, but comments with links will not be published. If you enjoy the posts here, please share them. 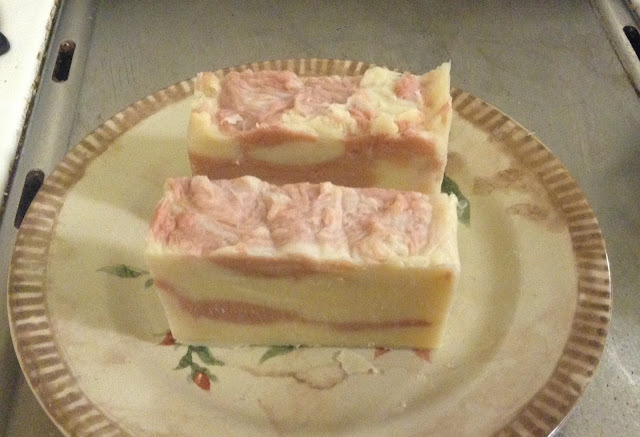 If it wasn't for the title about making soap, I thought at first that was 2 slices of cake on a plate, it really looks so nice. Thanks. Living Simply. This was my first batch of hot processed with a swirl. It sounds like an interesting process. I love handmade soaps and always look out for them at Craft fairs. It is, Cherie. It's chemistry and art combined. Thank you for explaining the process of soap making. It is fascinating to learn how the mixture changes. You are smart to take all of the precautions because those are some very harmful chemicals. I still have a scar on my hand from an undergraduate chemistry lab incident. in those long ago days we never understood the benefits of safety gear. The soaps are beautiful! Oh, that's a shame, Anita. It really helps to cover up thoroughly. Thank you, I am very pleased with these fruity, fragrant soaps! Those soaps are so pretty. Thank you for the explanation, Stephenie. One of these days I will try hot process method. It's nice to be able to use soap right away. I know, Nil. I remember. It's nice to have a stash, so that you never run out of it. At this time of year I never know how many I will sell, so I make a couple of batches of hot processed. That way there is plenty available for Etsy sales, gifts, and home. Thanks Andrea. The pink is is from using Brazilian rose colored clay. I ordered it from Brambleberry.